... from ignorance to truth, from darkness to light. Wild Dove Productions so we might get to know each other and, just maybe, share some time and space on life's great journey. I've always wanted to help create a better world. If you have struggled with the same dream, the same call, I'm hoping, somehow, this website will help us find each other. Leo Tolstory wrote that life is a journey "from ignorance to truth, from darkness to light." We're all on that journey ... together ... and I believe we're expected to help one another find truth and move into the light. 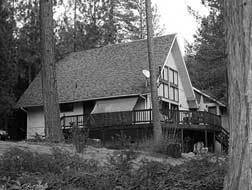 I'm blessed to own a beautiful chalet in the middle of the woods on the side of a mountain in the Sierra Nevada Mountains. It has given me a great way to share my love for the planet with friends and strangers and to help them - and me - find more truth about the beauty of our planet and about many other things and to move further into the light. 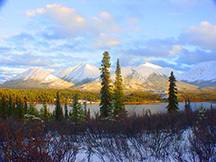 In 2011 the chalet was offered as a vacation rental and enjoyed instant success. Starlit Chalet hosts folks from Europe, Canada, South America and from all over the USA. Our guests are people in love with nature and thrilled to experience the magnificence of Yosemite and the Sierra. Less busy has been the chalet's use as a retreat center, Wild Doves Rest. I offer it as a place of retreat and, if interest is there, to lead Vision Retreats. In 30+ years of trying to change the world for children, I have learned the power of a clear vision and am always ready to share that understanding with others on the journey. And if you're not into exploring Yosemite or spending a weekend in quiet reflexion, how does Argentine Tango sound? Tango Chalet has been another way to use the chalet to move from ignorance to truth, darkness to light, in the world of dance and music. To explore the beauty of this extraordinary dance in a place of great natural beauty. We have a tango floor in the Great Room. and, in recent years, I've discovered the unique amable culture of Argentina and the charm of its people and, along the way, immersed myself in Argentine tango, beginning to understand that beauty and art - like nature - provide healing and joy in a despirited world. And they provide portals to truth and light. The journey goes on as I divide my life between California’s Sierra Nevada and Buenos Aires and try to share my journey through media. It has been my experience that, when we truly need a helping hand, an inspiring word, a new viewpoint, someone always appears. We may not recognize them, but they are always there! The books listed here are written by some of the guides who appeared and lighted my way. This list is provided so that you may more easily recognize that moment when a helping hand, inspiring word or new light appears in your life. Once to Every Man - William Sloan Coffin, Jr. Note: More information is available on most of these vision building blocks at our special page: Direct from Amazon. My story of 30 years helping children ... how does one create hope in a world with so many hurting children, so much war, greed and terrorism? How does one begin to change these awful realities? "There is a way through the dark mist ..."
You may order a paperback at Lulu.com You may also download the book at Lulu.com as an e-book in PDF format and read it on Adobe Digital Editions, Adobe Reader, Apple Preview & Stanza. The e-book may also be ordered at Amazon.com to be read on your Kindle, computer or iPhone. Touching The Rainbow Ground: 8 Steps to Hope (DVD) - Paul Weiss A video and photographic companion to the book. Available eventually! The more we get in touch with the beauty, the art, the great gift of nature, the more we are moved to protect it. And love the One who created it. Also see Gifts of Wonder on my blog, Rainbow Ground.